Click here for a sample of ANC036. I come from a long line of arsonists, she tells me. The kerosene can of her vapors through her nose. Tell me more, I say. But she falls silent. No, her lips seem to insist. Never. She handstands on the sun-baked lawn and walks towards me, pouring what’s left of her out. When faced with catastrophe, human instinct spurs creation; torched homes are restored, leveled cities rebuilt, communities revived. Yet for every feel-good story of new beginnings, a ghost town is lost to time: Beichuan, San Juan Parangaricutiro, Bor. The pathos lingering over much of New Orleans and Detroit, disasters at the hands of man and nature alike, speaks to our need for swift, clear-cut resolutions to communal misfortune. But what of personal loss? To flip the axiom: an earthquake is a statistic, breaking up is a tragedy. 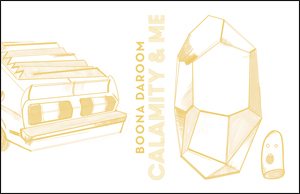 In Calamity & Me, Boona Daroom crafts a metaphorical love story between himself and the regular hardships of life. Told through a series of vignettes weaving transgressional style and syntax with obscured meanings and double entendre, the narrative employs personification liberally and on a sliding scale. Sometimes Summer is a season but sometimes she is a ghost plucking a cello in the narrator's room. The Atoms are merely the sensation of a breeze on his skin, except when they are a stoned swarm scarfing a loaf of bread. Calamity is both a partner and the allegorical manifestation of our daily woes. Seesawing between hilarity and heartache, the private and universal, Calamity & Me presents a pseudo-autobiographical account of the discomfort we all know so well. ANC036 is out of print.